You are probably wondering how a Syrah from Paso Robles could have gotten on to my blog. Well, I admit, this wine is decidedly not cool-climate Syrah but it does have some characteristics that give it so much elegance that I couldn’t help considering it for a blog entry. It’s more in the style of a southern Rhone wine, with aromas of dark fruit and licorice, and black olive and cured meat. The mid-palate is sweeter than I usually like but it does have a lightness which keeps it from being overbearing or cloying. The finish is all licorice, tobacco, and plum. There’s barely a hint of oak in the background and it’s balanced into the wine. Most years the winemaking team at Tablas Creek Vineyard does not make single variety wines. They blend the wines in the style of the Southern Rhone, which is in fact where their French Partner winery is located (Chateau de Beaucastel). But every once in a while, when a vintage is particularly good, he decides to make some stand-alone wines. 2010 was one of those vintages. 2010 was kind of a disaster vintage for much of California, characterized by a cool summer and then some seriously damaging heat spikes at the very end. But the Paso Robles region was able to avoid those heat spikes and the grapes were harvested after a long but consistent summer. I had the pleasure of trying the Tablas Creek Syrah in a previous vintage (which I believe to be 2006) and at the time I was struck by the wine’s elegance and structure, in frankly what I’d been referring to as the land of jammy wines. Tablas Creek for wine nerds like myself is pretty much hallowed ground. It’s THE winery that I make sure to visit every time I go to Paso. It consistently produces wines that have the structure and acidic backbone that many other wineries there lack. As fads come and go I think Tablas Creek will always be there because they’re just so damn consistent. This Syrah is a beautiful and elegant representation of how even in warmer climates, when it is handled in the right way, Syrah can still produce a pretty spectacular wine. 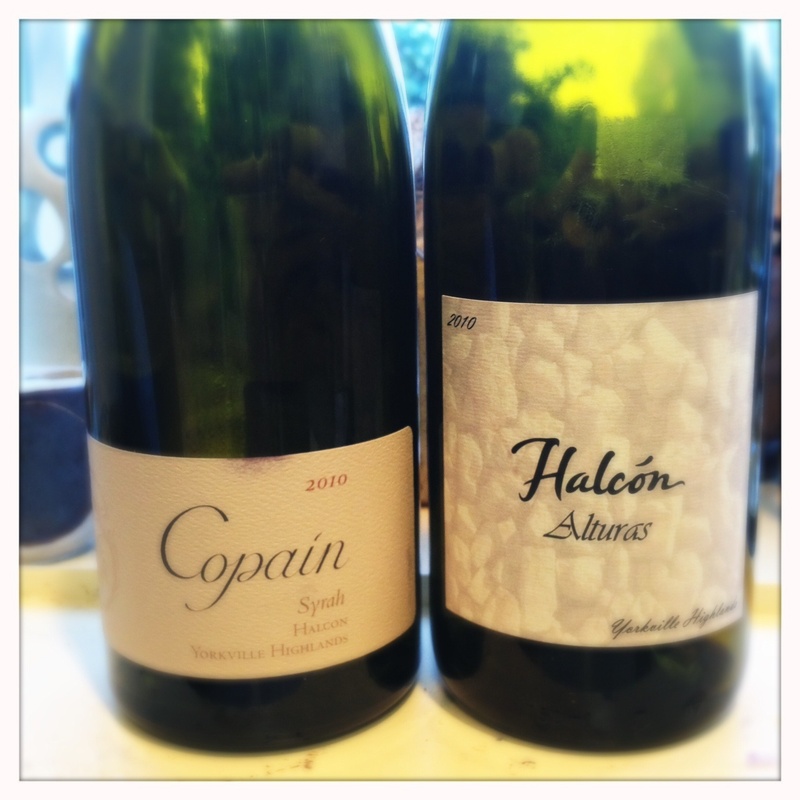 For this entry, I’ll compare two wines that are from the same vintage and same vineyard but made by different producers – the 2010 Copain Halcon and the 2010 Halcón Alturas. It’s an interesting exercise because there are so many wineries that claim that their wines are just an expression of the raw material they were given to work with. But is that really the case or do winemakers inevitably put their own stamp on the wines they make? The Copain Halcon at 12.6% alcohol is just all elegance and violet beauty. The nose has hints of celery mixed with those salty plum aromas that I’ve found in a lot of cool-climate Syrahs from similar regions. Wow, this is good. Lots of gravel aromas too. The mid-palate is so perfectly balanced with fresh fruit flavors of blackberry and under-ripe strawberry. The finish has great acidity. It’s such a French style of wine and really reminds me of a Northern Rhone iteration of Syrah. The wine was made with 80% whole cluster, which might have contributed to the overall complexity of aromas. The Halcón Alturas is totally different. It’s also good but simpler, juicier, and brighter, as opposed to brooding and savory. It has a slightly bigger style too, not jammy or oaky by any means, but with aromas closer to fruit compote or macerated fruit. There’s a similar floral component on the nose. Simply put, it’s a sweeter version of the Halcon Vineyard. At 13.7% alcohol, it’s not too sweet, but it doesn’t have that core of acidity, like the Copain does. Don’t get me wrong: it’s a beautiful wine. It’s elegant too. And it has the true Syrah aromas of plum, blackberry, and pepper, but it’s just slightly more Californian in style and there’s a lot less acidity on the finish. All in all the wines were very different although they shared a similarity in their floral aromas. Beyond that though, there wasn’t much the same about them. I could tell they were Syrah but I would probably never have guessed that they were from they same vineyard. Now, many, many different decisions were made in the winemaking process. Not the least of which were that Wells Guthrie at Copain picked earlier and used 80% whole cluster. I’ve heard it said that one bottle of wine represents a thousand tiny decisions by a winemaker to either intervene or not during a grape’s transformation into wine. These decisions invariably put a personal stamp on the wines so I guess it’s pretty obvious that a vineyard isn’t going to just express itself on its own. Many critics will tell you that there are certain characteristics that vineyards express across producers and I’m not necessarily disputing that possibility. But I’m guessing in those instances the wines are made in a similar style. I wasn’t really thinking about a winner between these two wines but if you twisted my arm I’d have to go with Copain. It’s just much more of a Northern Rhone Syrah. I wanted to go the other way because the Halcón Alturas is about half the price of the Copain, but the Copain is simply more my style. The Halcon Vineyard is certainly one to watch, and at 2,500 feet it’s got incredible potential to be a unique vineyard for Syrah in California. I can’t wait to see how the vineyard changes as it ages. Continuing my latest interest in New Zealand Syrah I opened up another wine that I’ve been hearing a lot about. Possibly the coolest name of any wine, the Bullnose is unfortunately a little bit on the oak-y side for my palate and I can’t help wishing that they’d have let the fruit shine through a little more. I can tell there’s pure fruit there, but it’s masked by overpowering oak-y aromas. It’s a bigger, richer style wine than the Fromm (previous post) and less my style because of that. I’m getting black olive and fruit compote aromas that are somewhat intriguing, but again, the oak is just a tad too much for my palate. Don’t get me wrong, it’s not a jammy, new world Syrah, it’s got an old world flair to it: there’s good acidity and pepper on the back end and this is definitely an example of vineyards with great potential that, in my opinion, just need to speak more for themselves. Te Mata was established in 1896 so this is one of the older houses in New Zealand. The current owners purchased the vineyards in the late ‘70s and began a twenty-year project of renovating the grounds of the winery and the estate vineyards surrounding it. The current vineyards are farmed sustainably. It’s definitely a winery that I want to follow, but unfortunately this effort is not quite my cup of tea or my glass of wine. 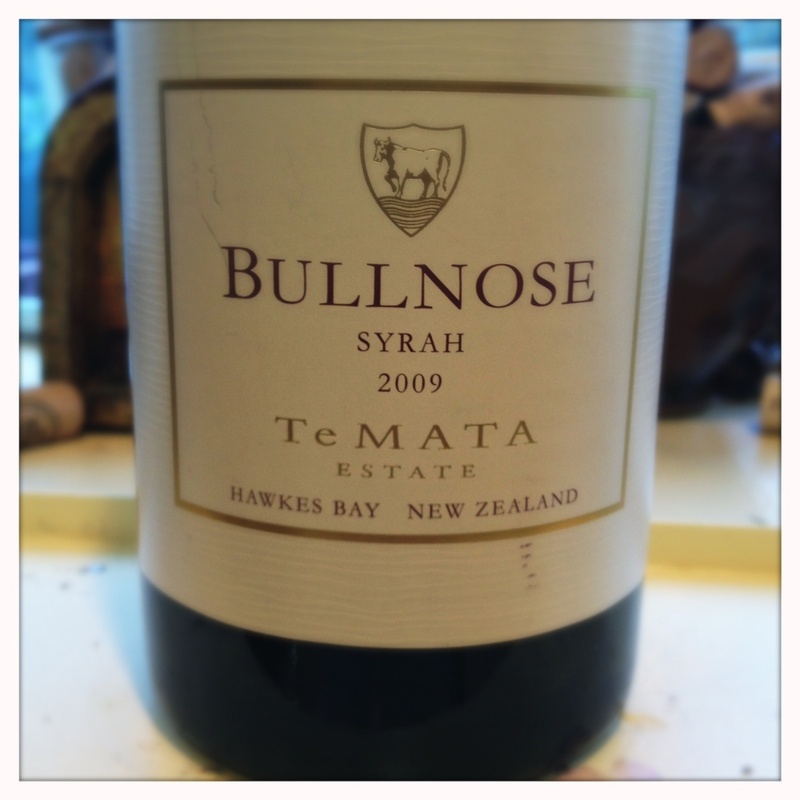 Although I’ve had a fair amount of Syrah from New Zealand, I think this is only the second one for the blog. I have to credit fellow Syrah enthusiast Ryan Woodhouse from K & L Wines in Redwood City, CA for pushing me to try more New Zealand Syrah and also to write about them more. 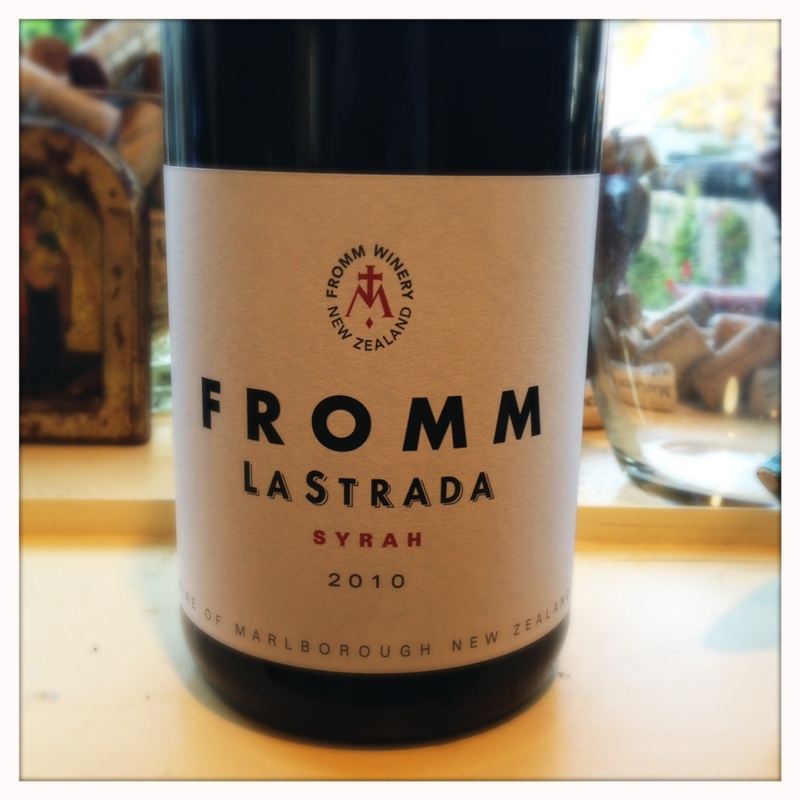 The Fromm La Strada has wonderful meaty aromas characteristic of cool-climate Syrah. There’s graphite on the nose too, and black olive, tons of minerality and this pure blackberry fruit. There’s also a tad bit of funk that meshes well with the other flavors. The mid-palate is full yet there’s a persistent elegance too, and the finish has that classic lift of acidity that I love so much in cool-climate wines. I’m surprised that this wine is 14% alcohol because I get no hints of alcohol. Although the winery believes that this is a wine that will peak in 2 to 3 years, I see the acidity in this wine allowing it to last for much longer. I’d love to put one down for a decade or so to see how it tastes then. The fact that I’m even considering this with a wine that’s only $20 shows you how good I think it is. This is definitely an epiphany wine for me and New Zealand Syrah. As a friend of mine who’s living there told me recently, “Dude, all the wines are cool-climate here! You’ve got to try more!” And as long as I can find them, I will do just that.